Have you seen the recent youtube video featuring Boyd Bushman? Bushman supposedly was a retired Lockheed Martin research engineer with insider access to the infamous Area 51. His “deathbed” confession exposes intimate details of aliens from the planet Quintonia. According to Bushman, a handful of these intergalactic travelers (who live for about 200 years) are among us, helping us learn about UFOs, anti-gravity, and space travel. Sadly, the pictured aliens Bushman holds up as evidence can be purchased at Walmart. Shucks. I don’t know when we started asking about aliens from outer space. For thousands of years, people thought the earth was flat and it was the center of the universe. The brilliant Renaissance thinkers Copernicus and Galileo enlightened humanity, teaching us the universe does not revolve around our planet. Through Galileo’s telescope, we would learn other planets in our solar system have moons too, and the sun has spots. Less than 100 years ago, Hubble would peer into the night’s sky and discover our Milky Way wasn’t the only galaxy. It’s an awfully big universe after all, and it’s hard to imagine we are all alone. Our galaxy has 300 billion stars, and there are at least 100 billion galaxies in the universe. Suddenly, asking, “Are we alone in this extremely vast Cosmos?” seems more legitimate. What’s at stake if we aren’t alone? On the one hand, it seems like God should create other life forms on other planets, since it would be a big waste of space otherwise. Then again, if we are alone in such an enormous ever-expanding universe, wouldn’t that make us extremely special? We’d be like God’s crowning achievement in creation then. And of course, some evolutionists think extraterrestrial life would instantly disprove God’s existence. But, life on other planets would not disprove God, you still need a Creator for a creation. I don’t see any Biblical evidence claiming there is or isn’t life elsewhere. In other words, I think the Bible is silent on this subject. The Bible isn’t a science textbook and it would be hard to prove the existence or the absence of extraterrestrial life from the Bible — though some people try to force space alien allusions on Ezekiel chapter one’s wheels of fire and strange looking humanoid creatures. So, is God wasteful with His universe or does He highlight His love for us, reserving us as His sole created creatures in the Cosmos? Let’s just say for the sake of this discussion that God has created life elsewhere. I’m not promoting this as reality, I’m just saying let’s momentarily allow the possibility of extraterrestrial life. After suspending doubt and imagining there are other intelligent life forms “out there,” I wonder, why on earth would God introduce us to each other? What am I talking about? There’s Isis in Syria/Iraq, Russia bullying the Ukraine, even here in America we have residual resentments from our Civil War, plus think about all the bombastic/divisive ads going into this month’s Midterm elections, there are inter/intradenominational squabbles, people have neighbors they can’t tolerate, and too many families languish in dysfunction. Thanksgiving is next week and while the pictures of the Pilgrims eating with Squanto are dreamy, decades later how did the story eventually end? It’s shameful the way Native Americans suffer to this day. 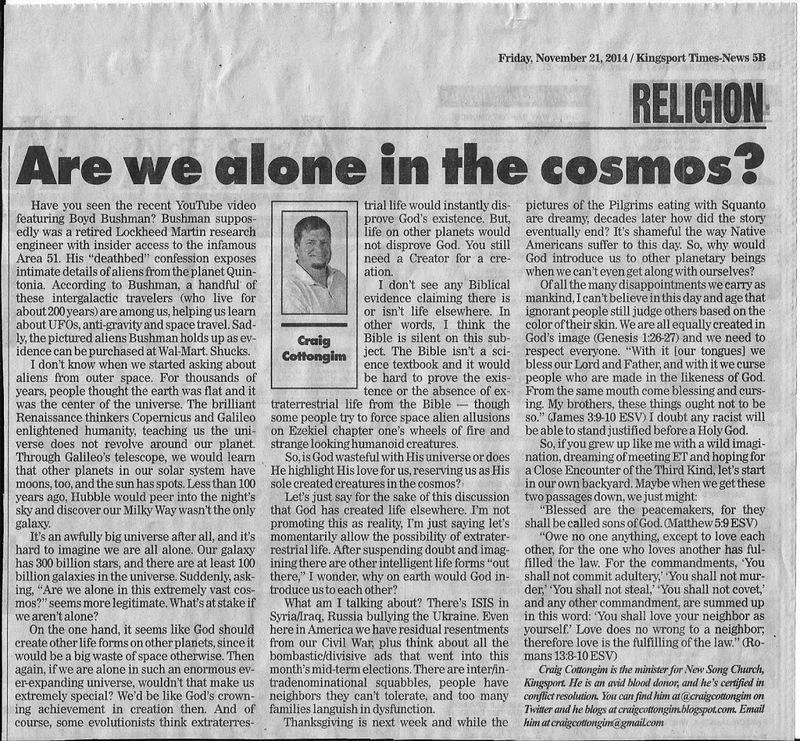 So…, why would God introduce us to other planetary beings when we can’t even get along with ourselves? Of all the many disappointments we carry as mankind, I can’t believe in this day & age ignorant people still judge others based on the color of their skin. We are all equally created in God’s image (Gen 1:26-27) and we need to respect everyone, “With it [our tongues] we bless our Lord and Father, and with it we curse people who are made in the likeness of God. From the same mouth come blessing and cursing. My brothers, these things ought not to be so.” (James 3:9-10 ESV) I doubt any racist will be able to stand justified before a Holy God.